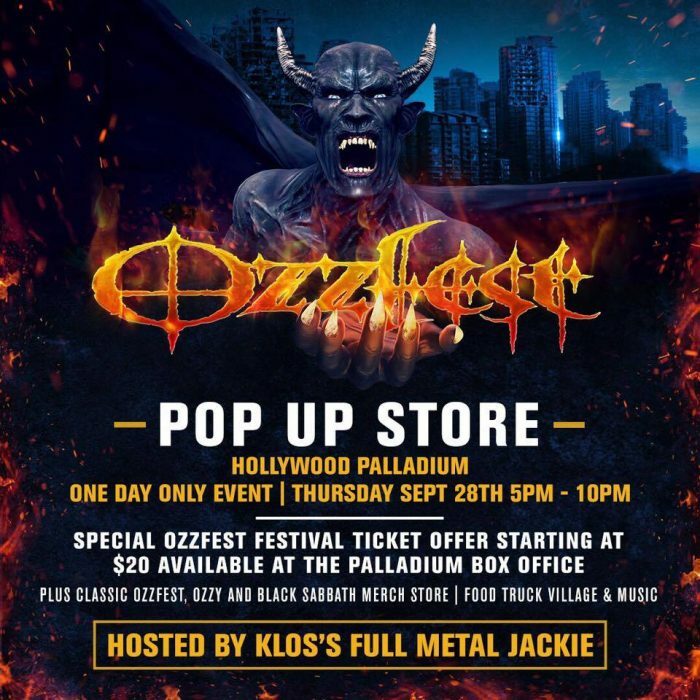 A one day only Ozzfest pop up store will be open this Thursday, September 28th from 5pm to 10pm at the Palladium in Hollywood, California. Come by the #Ozzfest Pop Up Store at the The Hollywood Palladium on your way to see Black Sabbath: The End of The End at ArcLight Cinemas Hollywood (or another theater) and get a chance to pick up something from the remaining The End Tour Merch or classic Ozzfest & Ozzy Osbourne Merch from our #Ozzy Pop Tent! There will be specially priced $20 Ozzfest 2017 Tickets available from the Palladium Box Office Window for these 5 hours ONLY! That’s 12 Hours of #Ozzfest for only $20 BUCKS! We’ll have a few food trucks to chow from plus the 955KLOS Truck with Full Metal Jackie DJing tunes for us! Come down and hang out! !